Occasionally, when we feel stuck, the only way to move forward is by finding closure with the past. When a major change in your life happens, whether by design or by chance, it is important to be able to release all of the mental, emotional and spiritual aspects of the past in a way that allows you to move forward again. At this point you need to put closure on the past. When you can find a couple of hours of solitude, write a long letter to the parties involved outlining all the feelings you have had over the years. They will never see it, so leave nothing out. In other words, allow the pain, the fear and the anger to flow out on the paper. Express it all. Now it is time to write another letter to yourself that expresses all the feelings of pain and anger you felt toward yourself. In this case, you write down all your frustrations, guilt and judgments that you made with yourself. Hence, there may even have been times that you hated yourself for your self-perceived weakness. In effect, this is allowing all the emotions to flow out of your body and onto paper. Finally, you will have to do these affirmations repeatedly for a few days as your body detoxifies itself from its pain. When you trust the process, and believe that what you are experiencing is a huge step toward letting go, you’re next steps forward will be revealed. Sometimes the things that we hold onto are simply just a rusting shell of what we thought we had. This old car was once someones pride and joy and yet here “she” is stripped of what “once was”. 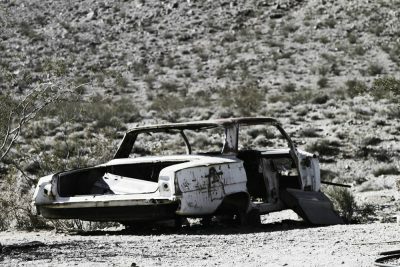 This photo was taken in Rhyolite, Nevada. Your website is AMAZING! Is much needed all over the world ! Keep up the amazing work you do, is NOT unnoticed! It soothes the SOUL ! I am so thankful for your website, it’s helping me through my pain every day. I’m with Liz and BR… Your website is amazing, thank you!